So, I can't say that it was Connie Willis who introduced me to the idea of reading Sayers; that was Nymeth, quite a long time ago. (She also introduced me to Connie Willis, incidentally, which I suppose means she's doubly responsible for me reading this right now.) For someone who considered herself to be quite up on the mystery genre, I'm ashamed to say I hadn't even heard of Sayers or Lord Peter Wimsey before that. It feels like a rather large omission. But thankfully, Nymeth and Connie Willis conspired to introduce me to another favourite mystery author, and here I am. Harriet Vane is a young woman accused of murdering her ex-lover by arsenic. It doesn't help that she is a detective novelist, and her latest manuscript describes in detail a murder by arsenic; or that in the course of her research, she purchased it several times using pseudonyms shortly before the young man died. The police and prosecution believe the case is airtight; Lord Peter Wimsey doesn't believe a word of it. Luckily, neither do some on the jury, and Lord Peter has one month to investigate the case and prove Miss Vane's innocence. I loved Strong Poison. I really, really enjoyed it. I loved the setting, I especially loved the characters, and I thoroughly enjoyed the mystery. The writing is charming and intricate, rife with slight details and hints that are easily dismissed unless one is paying attention. But even better than the mystery? The humour. This book was a good sight funnier than I expected, and not always in obvious ways. Once again, I've discovered an author with a dry, straight-faced delivery that cracks me right up. 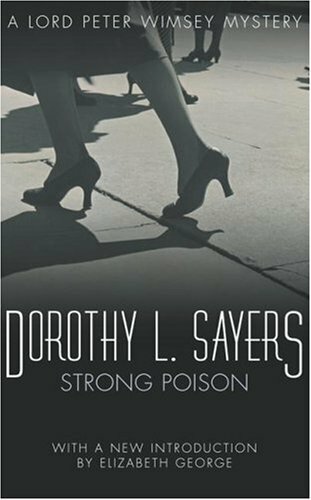 I wish I could provide you with an example of something that made me laugh out loud, but unfortunately the library only had one copy of Strong Poison, and it's got a steady rotation of holds on it. And no, I didn't have the foresight to write down my favourite parts. My absolute favourite part? When the Dowager Duchess, Lord Peter's mother, holds forth on censorship. It's a little jab at those who would censor books couched neatly in dinnertime conversation, a remark made by a character who has a tendency to be a little verbose and wandering. It's perfect. It delighted me utterly. Which brings me to the characters, which I think are this book's strongest point. Lord Peter, of course, is marvellous. He's not a perfect character by any stretch. In fact, Arachne Jericho did a splendid series on Post Traumatic Stress Disorder in fiction over on Tor.com, and Lord Peter starred in one of her excellent articles. This particular aspect of his character doesn't make much of a show in Strong Poison, but it's enough to know that it's there. He can also have the appearance of shallowness, and a definite sense of entitlement that I suspect could be slightly irritating if he wasn't so damn charming. Aside from Lord Peter, the supporting cast is excellent. I think one of the advantages of coming at a series from the middle (something I almost never do, and only did this time because Nymeth did it... lemming I am, yes) is that the long-running secondary characters are established and comfortable in their own skin. At least, if the author is good -- otherwise there is sometimes an assumption that the reader already knows the characters, and so sketches are found in place of true characterization. And Sayers is good. She takes the things she knows about her secondary characters at this stage in the series and uses this knowledge to create full portraits even if we only see the character once. There was something about Lord Peter's family and the other secondary characters that reminded me strongly of Deanna Raybourn's March family in her Lady Julia Gray mysteries. The debt is of course the other way around, if indeed it is there at all. Suffice to say, I like me a well-fleshed-out, maybe quirky, maybe just distinct cast of secondary characters. I am absolutely delighted to find a new-to-me mystery author I like so much, and I'm really looking forward to reading the rest of the Lord Peter Wimsey mysteries. I may go back and read them from the beginning, now that I've had a taste; I'd like to see Lord Peter's character arc through the series. Fans of mystery who have somehow, like me, missed out on Sayers shouldn't hesitate to pick this book up. A new author for me as well. Thanks for the post. Oh good! I'm pleased I can encourage more people to check out Sayers' writing. I hope you enjoy.